The altar for Wednesday's Mass is snug against the U.S.-Mexico border, with just a highway between its edge and the Rio Grande. That message hasn't gone down well with some in the U.S. at a time when borderapprehensions of families and unaccompanied minors rose significantly in the last three months of 2015. Francis came to the border metropolis of Juarez after flying out of Mexico's capital with a final tour in the popemobile and serenades by mariachi bands. His whirlwind five-day visit has focused heavily on the injustices faced by Mexico'spoorest, most oppressed and vulnerable to the country's drug-fueled violence. And he has taken Mexico's political and religious leaders to task for failing to do good for their people. On Wednesday, Francis told the 700 or so inmates gathered in the prison chapel that they cannot undo the past. But he said they have the possibility of "writing a new story and moving forward." The meeting came a week after a riot at Monterrey's Topo Chico prison, where rival gang factions bloodied each other with hammers, cudgels and makeshift knives. Ciudad Juarez's Prison No. 3 is relatively calm these days. But it has seen violent clashes before that reflected the chaos outside its walls. Times have changed. Last year, the city's homicide rate was about 20 per 100,000 people, roughly on par with Mexico's nationwide average of 14 per 100,000 — and well below what is being seen in current hotspots of drug violence such as the Pacific resort city Acapulco. Diaz, who along with about 30 family members secured tickets for Wednesday's Mass, welcomed the pope's calls for Mexicans not to tolerate corruption and violence. 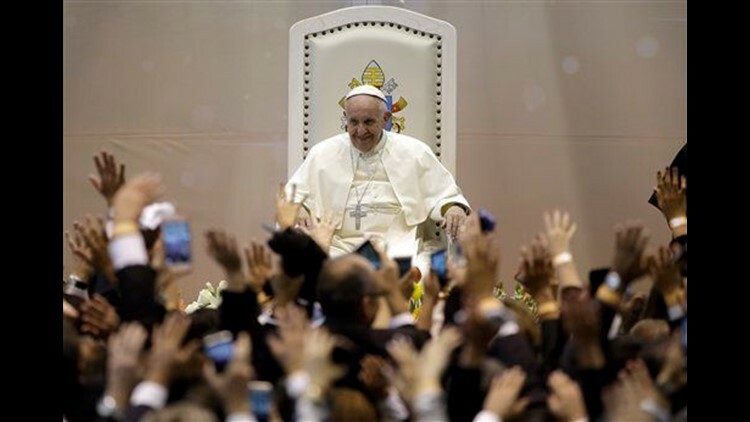 Francis also met with workers, employers and advocacy groups, warning that God will judge those who exploit workers and make them "slaves of our day" for their own profit. "Do you want to leave them the memory of exploitation, of insufficient pay, of workplace harassment?" he asked. What air will they breath? An air tainted by corruption, violence, insecurity and suspicion, or on the contrary an air capable of generating alternatives, renewal and change?"